MG Floral Designs, highly regarded as Atlanta’s premier florist, was originally started in the 1980’s by Marvin Gardens and later bought in the early 1990’s by Pat Doyle. After many years in the Buckhead area, we just recently relocated to Sandy Springs. Though over the years, things have changed, one thing remains the same and that is our commitment to the highest quality flowers with unparalleled customer service. With more than 30 years of combined experience, the staff at MG Floral is expertly trained in turning its clients’ dreams into beautiful, breathtaking reality. Begining in 2008, Pat Doyle has renewed her focus on the most important day in a couple's life... their wedding. 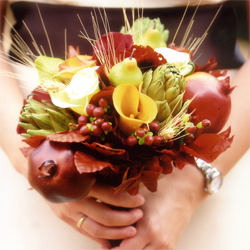 Pat's commitment to excellence is apparent in her unique and unexpected bouquets and arrangements that make every couple's wedding special and memorable. Please click here to make your appointment for your floral consultation. Our flowers are flown in fresh from world markets to give our customers the best product available. Our design style is broad – from traditional European designs to high-style exotics arrangements. All our designs are uniquely created for each individual client. This expectation of quality is showcased in our attention to detail and is the pride and joy of each and every bride on her wedding day. Weddings are our specialty and we are always thrilled to be a part of your very special day. We realize the unique challenges that today’s bride and groom encounter and can help in realizing the wedding you’re dreamed of.